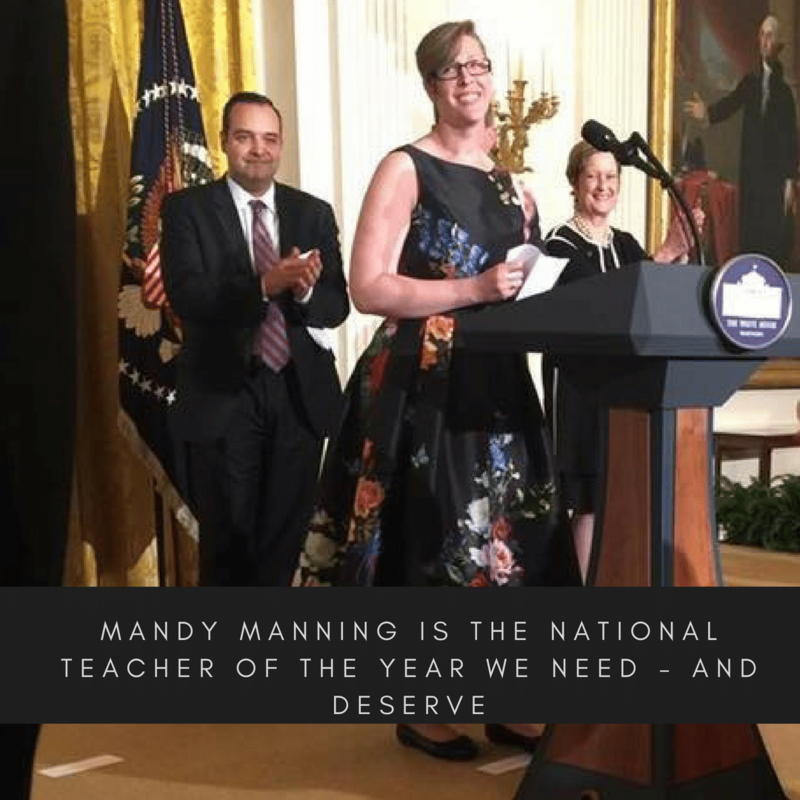 Most Americans only know Mandy Manning, the 2018 National Teacher of the Year, by their own knee-jerk reaction to the State Teachers of the Year Award Ceremony at the White House and, of course, the political fallout that occurred thereafter. She’s a darling to those on the left, adorning her formal, floral black dress with pins of silent protest: clockwise, Trans Equality Now, Peace Corp (where she was a volunteer), “Life begins at the end of your comfort zone,” National Endowment for the Arts, the National Education Association, the Women’s March, and gay pride. She’s also the same teacher who joined with her fellow State Teachers of the Year who stuck it to Sec. of Ed. Betsy DeVos by “confronting” the leader of the federal education department and expressing their exasperation with her after their meeting. To those on the right, she’s everything that’s wrong with the nation’s education system, disrespecting the President of the United States by not shaking his hand, (check out minute 5:00 for the supposed snub), “bashing him,” or because “she’s the teacher who hated Trump the most.” She’s also a teacher of kids who don’t even belong in this country because they’re illegal and costly. You see, both of these portrayals of Manning has got her all wrong. Let me paint a more honest picture for you. I first met our now National Teacher of the Year last summer on an NEA Foundation Global Fellows trip to China. Among this group of all-star educators, one from each state, Mandy and I made an instant connection through our love of writing, reading, and people. I could tell from the start that she was one of humblest people I’d ever met. Just listen to her acceptance speech as Washington State Teacher of the Year to see for yourself. In that speech, she talks about the other nominees much more than she talks about herself – that’s what makes he remarkable. That’s it. She didn’t bully her way on stage. She didn’t try to outmaneuver Trump with loaded language of her own. She simply wished to use her time on the national stage to express a love and appreciation for those students she serves. On CBS This Morning, the first words out of her mouth are that “students are wanted, welcome, and capable of anything.” Sounds like any National Teacher of the Year should. Maybe even better. In fact, the KREM 2 news station circled back to get Manning’s take on the controversies surrounding her lack of professionalism in (not) shaking the President’s hand. To quote the Teacher of the Year: “Yeah, definitely not true,” she said. The other State Teachers of the Year in the room corroborated her story that there was no snub. Manning’s been National Teacher of the Year for just about 3 weeks now, and she told me that “she and her family received death threats” over this piece of inflammatory flash fiction. You see, things have been this difficult for Manning because she’s not just the Teacher of the Year we need, she’s the Teacher of the Year we deserve. In an age of “me first,” selfish, empty rhetoric where “I’m right and you’re wrong” is the norm, we need Mandy Manning now more than ever. Over the next year, our National Teacher of the Year is going to prove how much we deserve her. I can’t wait to see it all happen.